As good as smartphone cameras have become, they still can’t compete with most traditional standalone cameras. There’s just no substitute for a larger sensor, and of course, true optical zoom. 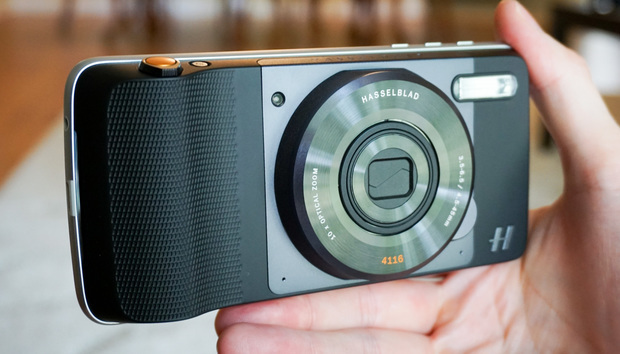 But now Motorola is addressing some of its phones’ photography deficits with its Hasselblad-branded Moto Mod. If you’ve got a version of the Moto Z smartphone (and that includes the Moto Z, Moto Z Force and Moto Z Play), you can slap this puppy on the back and get a more camera-like experience. The True Zoom Moto Mod offers a bit of a camera grip, a real shutter button, and true 10x optical zoom. But it also costs $249, similar to a lot of dedicated point-and-shoot cameras. We’ve seen plenty of snap-on lenses for phones. This isn’t one of those. This is a snap-on camera, complete with its own sensor: a 1/2.3-inch, 12-megapixel, backside-illuminated CMOS sensor with 1.55 micron pixels. In lay terms, it’s about what you’d expect to find in a low-cost point-and-shoot, but leagues short of the latest compact mirrorless cameras, let alone DSLRs. The lens (not removable) has an aperture of f/3.5 at its widest, and f/6.5 when zoomed in all the way. Again, this is typical of low-end point-and-shoot cameras. And it zooms from 4.5mm to 45mm, which, with a sensor this size, is the equivalent of a 25-250mm zoom on a 35mm camera. You’ll also find a xenon flash that’s much brighter than what you get on a phone. Using the True Zoom is easy enough. Just snap it on the back of your Moto Z, and it’s ready to go (only the Moto Z Play is currently supported, but a software update will add support for the other Moto Z phones very soon). Once connected, you’ll use the mod every time you invoke the rear camera. It physically covers the whole back of the phone, including the built-in camera, so what choice do you have? The True Zoom’s main purpose—providing real optical zoom—works as advertised. It can be a little tough to hold the camera steady when zoomed in, and the lack of a tripod mount doesn’t help. But there’s optical image stabilization, at least. But the story isn’t as good indoors. In low indoor light, I got slightly better results from the built-in camera on the Moto Z Play, and much better results from the Galaxy Note 7. The True Zoom’s photos were a bit dull in low light, and quite grainy. Here’s a crop to illustrate the difference. In low indoor light, the True Zoom mod doesn’t stand up to the best in-phone cameras. Your camera mode options change a bit, too. You can shoot in color, black and white, or JPG & RAW, but the option to shoot HDR images disappears. It doesn’t appear that the True Zoom has a particularly good dynamic range as cameras go, so it’s a shame to see HDR get the boot. You gain a few scene modes, but lose HDR. Also, burst mode appears to be effectively ruined by using the True Zoom. Because the camera data has to pass through the Moto Mod interface to the phone for display and processing, burst photos snap off at about one image every 1.5 seconds or so. The Moto Z Play I tested was about twice as fast during burst mode without the mod attached, and even that was slower than other phones on the market. If you regularly take outdoor photos with your phone and find yourself missing the zoom from a point-and-shoot camera, this will absolutely give you that. And having the photos right there in your phone ready to edit or share is a lot more convenient than having them trapped in a separate camera. But in my first hour or so of use, the Hasselblad True Zoom doesn’t otherwise improve camera quality in a notable way. If lugging around a big camera attachment (there’s a nice carry case included) just to get 10x optical zoom in good lighting conditions seems like it’s worth $250 to you, this Moto Mod is worth it. I would prefer something with a larger sensor and more dynamic range that produces images far better than a phone is capable of, even if it drives up the price a bit. If I were going to spend $250 to take better pictures than I can with my phone, including optical zoom, I would buy a dedicated point-and-shoot (Canon and Nikon both make decent models in the $200-250 range).